The repository is hosted in a limited bandwidth shared hosting which I have for playing around with Django. Please dont abuse it. I couldnt afford larger hosting because I'm still a (jobless) student and currency exchange between MYR and USD is kindof too high for me. The compiz packages are based on Fedora 7's compiz specfiles and added together with bits and pieces from Fedora beryl packages. The package sets are similar to beryl's. I dont have any KDE specific builds mainly because I don't use KDE and not familiar with beryl/compiz's KDE packages. * NOTE: the compiz packages will obsolete Fedora 7's compiz-0.3.6 packages. After this step, you'll have compiz-core, compiz-fusion-plugins-main, emerald, emerald-themes, and compizconfig-settings-manager the core compiz 0.5 from freedesktop.org installed your computer. For Compiz-Fusion, you will require to also yum these. For the time being , there is no exact/convenient way to launch Compiz that I know of (yet). Or, you can try out compiz-icon. compiz-icon is an app similar to beryl-manager. However, it does not work in my computer, but maybe you have better luck than me. compiz-icon package also provide a script called compiz-manager that will do the if-else for the manual launch above, if compiz-icon doesn't work for you, you might have better luck with compiz-manager. However, compiz-mananager does not have any tray icons etc despite the name. It only launches compiz and provides some useful (to some) commandline tools. 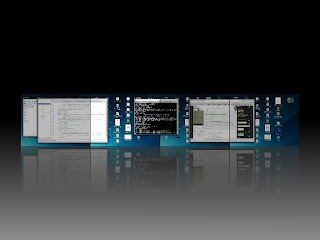 For technical support related to compiz itself, please goto OpenCompositing Forum at http://forums.opencompositing.org/ and ask there. I will only attend problems related to my packaging. Please contact me, you can put up your fedora repos at foss.org.my. Thanks for the great stuff. Wish you all the best for the future. Thanks for the repo. compiz can be run from Gnome with its desktop effects menu. You can also run compiz with Beryl manager. Just run Beryl Manager and then select which one window manager you want to use : beryl, compiz or normal kwin/metacity (gnome) wm. I am also glad to hear that it doesn't mess up with the original compiz packages. 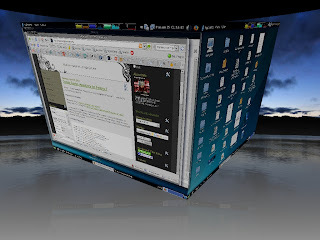 err .. this is not beryl .. this is Compiz Fusion , the offspring of Compiz and Beryl merge ..
i know that. Try beryl. u'll know it will run compiz too. sadly .. that still does not work in my computer ..
hello, I deem you have done a great job! Can you tell me how I can disable everything and return to what I had before -- that is, the simple Metacity, without Compiz, Beryl, or Compiz-Fusion? The new repository seems to be missing some essential compiz packages (eg "compiz"). simply uninstalling doesnt work? compiz wont launch if you didnt start it ..
if you used using desktop-effects menu when trying to enable it, you might want to check this gconf value. Just love your work!! Thank you!! I ran into some problems, and wanted to reinstall, used the new repository, but gives me "Metadata file does not match checksum". Another question, i have a HP NX8220 with an ATi Radeon Mobility X600 3D Accelerator, and running Fedora 7, i have read and tried almost every possible solution to get my fglrx driver to work, with no success. If im not mistaken, you have a ATi card, running compiz? What driver are you using? Awesome instructions and awesome results. Except- After messing around enough, I've discovered that using Emerald as the decorator causes things to freeze up within seconds, usually when scrolling in, say, Opera. But it's not limited to that. Using GTK as the decorator works fine though (so far). Any clue (or solution) as to why Emerald causes the freezeups? I'm running AMD x64 with latest nvidia proprietary driver, but have done tons of troubleshooting to no avail. Hi Erik, Try this.. It fixed a similar issue for me with beryl. the white border at panels and popups are a known problem with the gtk-window-decorator of the particular compiz version which I packaged .. just use emerald as ur decorator and that'll dissappear ..
p/s: goto fedoraforum to find compiz 0.6.0 if you like .. I dont think i'll be updating my packages until my semester break. hope you update repos soon. Compiz 0.60 seems to be released now. compiz packages are now maintained within Fedora main repositories.